The gorgeous Mitchelville Freedom Park, also known as the Fish Haul Creek Park, is a unique little property that is undergoing a transformation designed to properly honor the site's significant, historic roots. As the original location of one of the first freed slave communities in the country, and currently serving as a haven for migrating and permanent shorebirds, the site will appeal to a wide range of interests. Take a stroll along the long wooded boardwalk through the woods, or head to the rocky beach that changes its entire landscape every few hours, and see why this stunning up-and-coming attraction is one of Hilton Head Island's current best kept secrets. 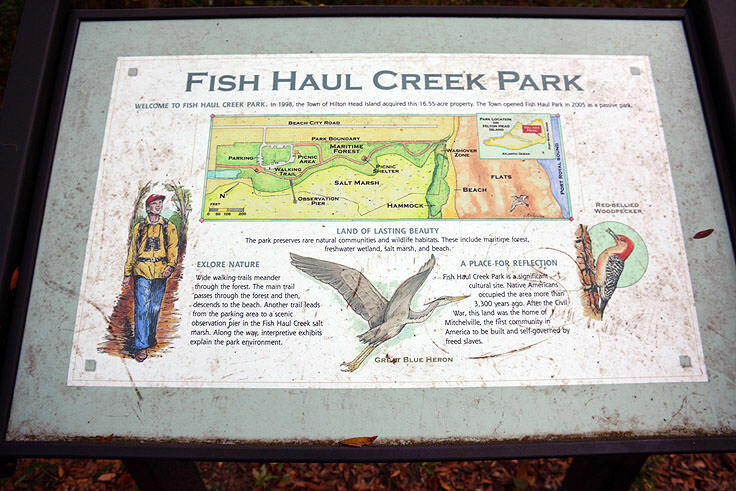 The Mitchelville Freedom Park is located on the northwestern edge of Hilton Head Island, close to Fish Haul Creek and acres of muddy marshes and rocky, sandy flats. Located at almost the very end of Beach City Road, the small "Fish Haul Creek Park - Future Home of Mitchelville Freedom Park," and subsequent small parking, is arguably the only indication that this wooded and waterfront paradise exists. Frequent visitors are grateful for this, as it ensures that the terrain remains isolated and rarely visited, and even summer season visitors will likely spot only a handful of other park patrons enjoying the scene, if they encounter anyone at all. Once at the park, visitors can travel a wooden boardwalk to a covered gazebo overlooking the open marsh for exceptional views, take off on a light adventure through the woods via a well-tended path, or enjoy a picnic at a covered picnic shelter. Most visitors, however, attest that the best way to enjoy the park for a full day is to take the Palmetto and Live oak-lined path all the way to the beach, which is just-barely oceanfront and actually connects with the inlet borders, and is simply out of this world. The flat, sandy beach is lined with giant rocks - unusual along a southern coastline - and is a Mecca for migrating and local shorebirds of all varieties. Sandpipers, plovers, gulls, pelicans, cormorants, and even herons can be spotted all along the water's edge, picking away as the fresh food supply that rolls in with the tide. Fiddler crabs with their distinctive giant claws, mud crabs, and hermit crabs are all common in this region, and the beach is also known as one of the best places for seashells on the island. Perhaps the most remarkable aspect of this seashore however, besides its inherent remoteness and lack of other beach-goers, is the ever-changing landscape. During low-tide, the horizon is nothing but long, flat sand, with the ocean seemingly miles away, but as the tide comes in, and the waves come closer and closer, the scene changes completely. Because of this attribute, visitors are encouraged to visit during both a low tide and a high tide, for two completely varied and different experiences. The beach is not particularly good for swimming or body boarding, or for lounging on the sand for a day considering the constant ebb and flow of water that comes with the tides, but it is a paradise for shell-seekers, nature lovers, and anyone who appreciates a strip of sand to enjoy all to themselves. The park currently also features restrooms to make a long visit an easy and convenient affair, but it's the future of the park that really has locals and longtime visitors excited. In fact, the park has another remarkable legacy beyond the distinctive beaches, as it is the site of the original Mitchelville, one of the first freed slaves villages in the country that originated, amazingly, during the Civil War. After Union troops successfully attacked and occupied Hilton Head Island in the first months of the Civil War in 1861, all of the resident slaves that worked at the local cotton plantations were freed, and started their own "town" right on the island. Protected by Fort Howell, hundreds if not thousands of newly freed slaves planted roots in their new community, and Mitchelville effectively became known as America's first post-Civil War settlement for freed slaves. 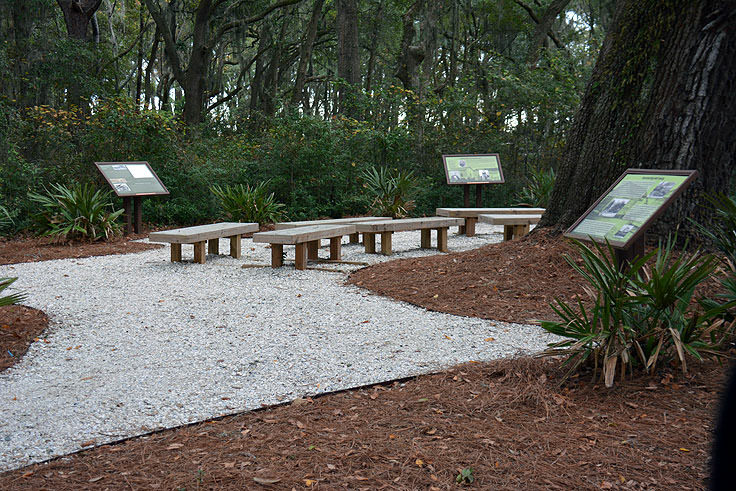 In 2005, a group of Hilton Head citizens started an initiative to preserve and protect this heritage, and the Mitchelville Preservation Project was formed. With the end goal of creating a gorgeous park that will include recreations of the original town, an ever-changing series of exhibits and learning opportunities, and a network of trails that will shed new light on the site in its entirety, the park's master plan is an ambitious one, but will certainly be a spectacular addition to Hilton Head's cultural and historical attractions. Interested patrons and visitors can keep tabs on the project as it progresses at the Mitchelville Preservation Project's website, http://www.mitchelvillepreservationproject.com/, and can also make donations to the broad endeavor online at http://www.mitchelvillepreservationproject.com/1862-join-us/. The project also welcomes volunteers, and interested parties can email the organization at volunteer@mitchelvillepreservationproject.org. In the meantime, visitors who are interested in soaking up the fascinating history of Mitchelville, (including its ties to the Gullah culture), will find a number of historical tours available that explore the Mitchelville Freedom Park in addition to a number of other secretive but significant sites along the island. These local tour companies and organizations, including Gullah Heritage Trail Tours, Coastal Discovery Museum at Honey Horn, and Custom Group Tours of Mitchelville and the Lowcountry, paint a complete portrait of life in the Lowcountry from the first European settlers to the historic legacies of the Civil War. Most tours are offered daily and year-round, allowing visitors of all seasons to take advantage of the opportunity to learn something new. 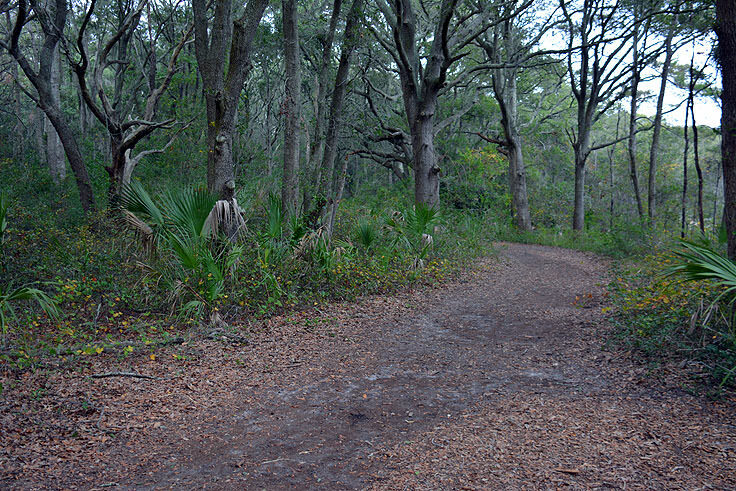 Regardless of whether a visitor makes a trek to the Mitchelville Freedom Park for a history lesson, a nature walk, or just a unique trip to the beach, this Hilton Head Island site is sure to be a favorite destination during any coastal adventure. With a rich history and a gorgeous landscape that is always changing, but always endlessly scenic, this secretive park is sure to become a memorable and favorite aspect of any Hilton Head vacation.